Tennis Victoria in partnership with the Victorian Institute of Sport and Sport and Recreation Victoria, supports emerging elite athletes from country Victoria through the Regional Academy of Sport network. Tennis Victoria provides resources and works closely with the Regional Academy network across country Victoria to deliver tennis programs and a pathway that complement each athletes existing weekly programs with their private coach in their local environment. There are 6 Regional Academies of Sport in Victoria. They are Barwon, Bendigo, Gippsland, Southwest in Warrnambool, Sunraysia in Mildura, West Vic in Ballarat and a seventh program, Tennis Victoria’s own North-East Tennis Program in Wodonga. 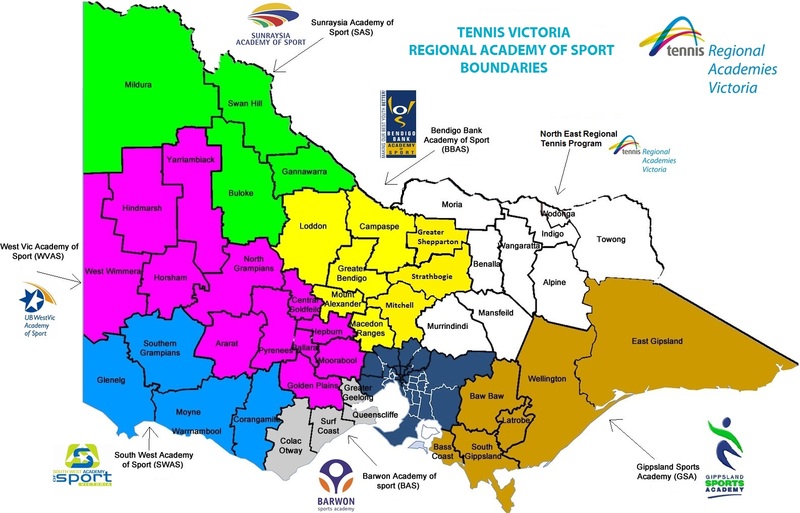 Each Academy has a catchment area that is aligned with Tennis Victoria’s 11 country tennis regions and uses the local regional council boundaries (refer map for these Academy catchment areas and boundaries). Victoria players are aligned to an Academy catchment area based upon where they reside. For players residing in NSW (e.g. Albury, Moama or Barham), players will be aligned to the Academy catchment that the players’ Victorian Tennis club is within. Each Academy tennis program has up to 18 athletes aged 12 to 18 years of age. All players must be a registered player with a tennis club or centre in Victoria. View the Regional Academy of Sport catchment areas below. Opportunity to be part of Tennis Victoria’s Tournament Tours to inter-state ITF Junior tournaments (subject to age and tournament eligibility). Opportunity to be part of Tennis Victoria’s Player Support Program (subject to age and Australian Ranking eligibility).